I dedicate this post to the ladies who are thinking about loc'ing or in their 1st-6th month of loc'ing. Believe it or not, I didn't always love my locs. In fact, I realllllly didn't like them. Can I be honest? I am ashamed of myself. Who hides away from social activities because of their hair? For someone who claims to have reached this awesome level of self-love, there is no reason why I should have felt this way. It's easy to understand that but hard as hell to go through it. I found that blogging about my journey made it worse because it was a constant reminder that I had a loooooong way to go. I was silly and anxious. Impatient and intolerant. All over hair. I now understand why they say that loc'ing your hair is a journey. Just wait and see how your thought processes will change. How your ideas will change. All prompted by the change and growth of your locs. It's amazing. And it's worth the wait. I encourage y'all to hang in there. Surround yourself around like-minded folk. And I'm not saying all of your friends have to have locs but it is important to have a nice and strong support system. Follow blogs, read books, visit online resources. Educate yourself about what your hair is doing. This is a new journey and to go in it blindly will indeed lead to frustration. 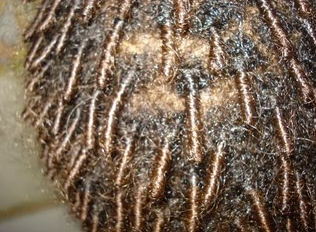 Even if you decide to loc without a professional, visit locticians in your area. Ask them for a consultation. Most will do so without charging you. Talk to other loc'ers. Get inspiration, advice and support from them. And celebrate milestones. Made it through Month 3? Celebrate! Managed to get a ponytail? Celebrate! Colored your hair stupidly 4 times in a year and didn't loose any locs? Celebrate! The more you thoroughly enjoy and acknowledge the loc'ing experience, the greater you will feel about yourself and your locs. Now the UP side to blogging my loc journey is that I am able to look back. Each month I celebrated my locs. I look back at photos and am amazed at how far I've come. This, I think, is a must. A visual journey will keep you motivated. Document your journey. Write about it. Vlog it. I can't tell y'all how many YouTube videos have inspired me to hang in there. And all these ladies were doing was talking about their locs. That's it. Educate others. If they ask "Why does your hair looks like that?" Tell them. If they want to touch the locs...slap them (hehe). I am the only loc'd lady in my family. I get a lot of questions. And lot of disses too. I don't care though. The more people ask about my hair, the less ignorant they will become. And the less ignorant people become, the better this world will be. Am I right, or am I right? Yes, people may give you funny looks. Yes, people will assume that you don't ever wash your hair. Yes, people will probably think you're Rastafarian, vegan, super Afro-centric, a neo-hippie, unconventional, etc. Yes, people will judge you. You may be the only loc'd lady in your office, classroom, social circle or group. You may actually stand out. And you know what? I don't have a problem with it. I have embraced it and I love it. India Arie says "I am not my hair" but I disagree. My hair tells a story. It is strong, unique and versatile. It is constantly growing and changing. Love your locs and always ALWAYS love yourself! Aw what a lovely post, well-said my dear! Your blog as well as so many loc videos on youtube have kept me inspired and excited for the locing journey. I have dealt with frustrations as well with mostly my new growth not locking, but now it is and I finally feel more relaxed about the locking process in general, like i don't obsess about it anymore, i just let them be and follow my regime as normal. 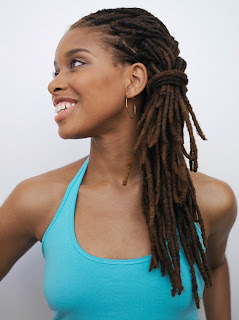 As a lot of people say about locs, embrace every stage of the locing journey because you will look back and say "oh i miss those days when they were short." Wow,thanks for the beautiful words of inspiration. I've been loc'd 2 yrs (March 20th) and I find myseelf getting frustrated at times. In a recent blog post of my own where I was venting, I admitted that I sometimes just want to cut them off. But I know that's just because I'm still adjusting to this journey I'm on. I work in the corporate environment and am surrounded by all straight-haired ladies and sometimes I feel like I no longer fit the mode of where I spend so much time of my day. However, when I think of not having locs, I know I don't want to go back to where I used to be. I LOVE the freedom I've obtained since locking! I think everyone should read this, newbies, vets, and dream loc'ers! I always tell folk that I never went through an ugly phase. The "ugly phase" is IN our heads, not ON our heads. And I owe that to tracking my progress on fotki. I was able to get the constant support and positive feedback that I didn't recieve from my friends, family, or my mirror. I was able to look at others albums and see that I wasnt in this alone. B!!! Thank you so much for this post. I just came back from getting my locs tightened and my loctician said I'm coming along nicely. One of the women that was there waiting for her daughter's hair to be finished looked at my freshly washed locs and asked...ooooh how do you get her hair to curl like that? Once my loctician told her it was naturally curly and she didn't do anything, the woman says "Girl you are going to have some beautiful locs. Your hair is GORGEOUS already!!!" I beamed like a proud mama. HA! Was this the same newly loc'd chick that was just last week thinking of cutting her hair off cuz she missed her loose naps? Vanessa---> It's so true though! When I look back at my 10 month old pictures I'm like, "Aww...I miss when they were that short!" I used to obsess over mine a great deal. It's amazing what happens when you just...stop. LA Jefferson---> I know exactly what you mean! I work in a professional setting and sometimes when I'm out at meetings, I feel like I "stick out". I try to guess what people are thinking about my hair and it is never positive. Self-doubt is human nature but I wish I could get over that! Bsquared---> Right you are, sis! I try to discourage newbie loc'ers from saying "ugly stage". It truly is a state of mind. And yep, that support (most of mine was online, ha!) is soooo needed. Just Bless---> Aww mama! I am soooo happy for you!! Nothing like a good scalp washing from the loctician. And compliments don't hurt either! Keep that high and if you fall, we got yo back. And uh...tell me more about those hair cuffs. Thanks for sharing. I find it that I actually love my locs. I am 6 months in and didn't struggle with the "this looks a mess phase." I would just pin it up and keep it moving. I too, have a picture that I aspire for my hair to look like and if I get discourage I will just take a peek at the picture.. I love my locs and the transition that it has to go through. its teaching me that even in everyday life we have to go through in order to reach the goal. Thanks hun. Your posts reach out to ALL of us, even those who aren't locking up. ;) Good lookin' chicka! Thanks so much for this. I am celebrating my 8 week loc anniversary tomorrow. When I first started, I had a feeling that I would have negative thoughts about my hair, especially after speaking with friends who have locs and reading your earlier blogs. Boy, were you guys right! What keeps me going? Seeing beautiful locs on other people, and knowing that they went through the same ups and downs that I'm going through now. I've got to agree with B^2. I think the only reason that I have yet to have a bad hair day since getting my comb coils back in August is because of the awesome support I've had. I've found this both online and from my husband, my mother (who has relaxed hair but continues to search high and low for products that might work well for my locs) and my younger siblings. My friends, my students, strangers...all have done nothing but compliment me on my hair...well, except for one guy at a grocery store...but eh. Even my former beautician saw my hair and said that it looked great and suited me well! Also, being online, looking at the experiences of others, checking out pictures of you at different stages to make sure that my hair is relatively normal...all of these things have greatly helped me enjoy this experience! ain't gon' lie... i still don't love my locs, and i've been wearing them as long as you have (although this is my second set). i think it's personal, and it's not shameful or bad to admit that you don't love something. what's important is that instead of cutting them off, we stick it out and learn to love it. btw: i loved my afro. LOVED it. I too have been very inspired by your post! My sis sent me a link and the rest is history. I love it! Now I gotta learn how to BLOG and become a blogger. I'm feeling so last year right about know. see ya soon! very inspired B! i look at your blog all the time to get tips, udates, and all that good stuff. Im one month in my locing process and the crazy thing is that i haven't had those..." i hate them moments" I actually love them to death! lol i do have the.. "dang i want some length and color" thoughts tho lol but def keep up the great work i love reading your blog! currently its my 7th month since i loced my hair. i am at a point i just want to give up. My question is would you recommend loc extensions? The reason i ask is because my hair at this point does not complement my face at all. PLEASE HELP!!!! !